Located on Colorado’s western slope, Delta County is quickly becoming one of the state’s premier mountain bike destinations. With a wide range of elevations, uncrowded singletrack trails, and mild climate, the area offers something for every class of mountain biker, from beginner to expert. 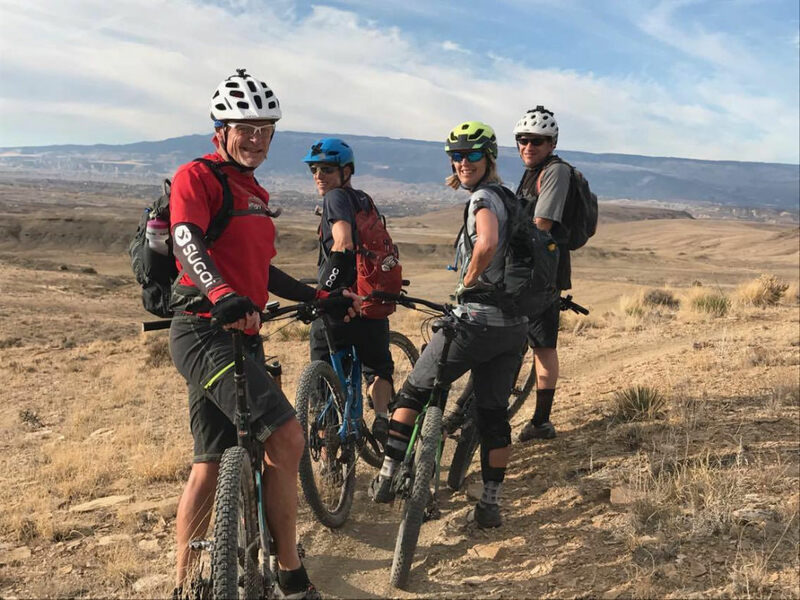 Twisting 22 miles along the western edge of the Gunnison Gorge National Conservation Area, the Sidewinder Trail is not only the best ride in Delta County, but one of Colorado’s must-do trails for experienced mountain bikers. The exhilarating trail is not a beginner ride-in-the-park. Miles of technical singletrack edge past cliffs, cross bare slickrock, drop off ledges, and dip through shallow canyons. True to its name, the winding trail is a blast to ride with plenty of techy sections that keep you entertained and earn it a black diamond rating. Sidewinder boasts 3,000 feet of heart-pounding elevation gain if you ride it from north to south, but there are also screamer downhills and fast flowing sections. While most of the trail is for advanced riders, intermediates can pedal easier parts between access points and walk their bike through the worst of the rocky terrain. Sidewinder Trail dips, rolls, and traverses the western slope of a long ridge that divides the wide Uncompahgre Valley from the Gunnison River as it rushes through the 14-mile-long Gunnison Gorge on the east side of the ridge. The entire area, protected in the 62,844-acre Gunnison Gorge National Conservation Area, is a playground not only for mountain bikers but also rafters, kayakers, and fishermen. Much of the Sidewinder Trail features rocky slopes in high-desert terrain. Sidewinder passes through high-desert terrain, characterized by dry washes and rocky slopes dotted with scrubby piñon pine and juniper trees. Most of the trail is wide open, offering stunning views across the valley to the Uncompahgre Plateau. Take a peek around when you stop to catch your breath or survey the next trail section. The jagged crest of the Sneffels Range etches the southern skyline, while the dark bulk of Grand Mesa, reputedly the biggest flat-top mountain in the world, fills the northern sky. Completed in 2010, the Sidewinder Trail was a joint effort by the Bureau of Land Management, local trail groups, Bicycle Colorado, and the Western Colorado Conservation Corps to increase Delta County’s recreational opportunities. The multi-use trail is open to bikers, hikers, horseback riders, and motorcycles, so be prepared to share the trail and check ahead before bombing down a shale hill. Since Sidewinder is a brutal challenge as an out-and-back ride, most bikers ride it one way. You can either be picked up at trail’s end or ride the Peach Valley Road back to your car for a 38-mile day. While the trail can be ridden in either direction, it’s best to pedal from south to north since it has better flow with 2,000 feet of elevation gain and 3,000 feet of downhill, and who doesn’t like fast downhills? To ride south to north, park at the North Sidewinder Trailhead at the end of H75 Road and ride the dirt Peach Valley Road south to the Eagle Valley Trailhead to start your fat-tire adventure. 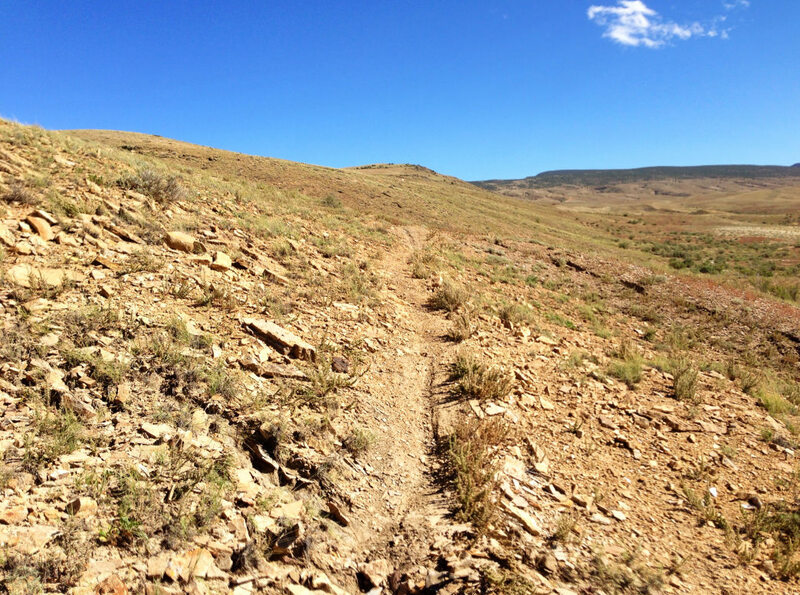 Many riders prefer to break the trail into shorter segments, riding part of it and then dipping down rough side tracks that cross the trail like Ute, Duncan, and Bobcat roads. Finish by riding back on Peach Valley Road to either trailhead. A good short ride starts at Eagle Valley Trailhead and follows Eagle Road for 1.5 miles to Sidewinder and heads north for 4.7 miles to Bobcat Road, which drops back to Peach Valley Road. It’s best to plan your ride with the Sidewinder Trail map published by COPMOBA. Allow five or six hours to ride Sidewinder, stopping along the way for water, snacks, and photos, and then a couple more hours if you’re riding Peach Valley Road back to your vehicle. If you’re biking in summer, get an early start and bring plenty of water; the trail is hot and exposed with little shade. Spring and fall offer pleasant conditions with warm days and sunshine. Winter can be perfect too since snow on the trail dries quickly and the air temperature can be 10 degrees warmer than Delta. Avoid Sidewinder in bad weather or if there’s any chance of rain since it gets muddy and impassable, especially the sections crossing shale hills. The 22-mile Sidewinder Trail is one of Colorado’s must-do trails for experienced mountain bikers. After biking Sidewinder, you’ll be ready to ride some of Delta County’s other tracks. The excellent Smith Mountain Loop, beginning at Sidewinder’s north trailhead, makes a 12.3-mile loop on doubletrack dirt roads. The scenic ride edges along the rim of the Gunnison Gorge and then returns alongside the Gunnison River. Across the valley is the Escalante Rim Loop, perfect for beginner and intermediate riders on historic 4×4 roads. Riding Sidewinder Trail is a big deal—so you’ll want to celebrate your success and toss back a brew with your bike buds. Head over to the town of Delta for local beers at Needle Rock Brewing Company. Other good options in Delta County the Flying Fork Café, Zach’s BBQ, and The Living Farm Café in Paonia. You will have earned your meal.